This week, the Trust’s hoard of treasure from the Williams & Griffin store in the High Street at Colchester – ‘the Fenwick treasure’ – has been undergoing work in a laboratory. A conservator and an archaeologist have been working together to ‘excavate’ the treasure and begin its conservation, while also producing a record of the process. The Trust found the treasure in the last few days of our excavation at the store, at the end of August. For security reasons, we did not make the discovery public until the following week. The news of the treasure created a huge amount of media, archaeological and local interest. The treasure was found where it had been hidden during the Boudican revolt of AD 61, under the floor of a room in a house which fronted onto the Roman town’s main street (now the High Street). In AD 61, the native Britons revolted against the Roman occupation of Britain and burned the Roman towns of Colchester, London and St Albans to the ground. In Colchester, they also massacred the inhabitants. We now know that, as the Britons approached Colchester, a wealthy Roman woman in the town buried her valuables under the floor for safe-keeping… Colchester, London and St Albans all have a layer of Boudican destruction debris under the ground, precisely dating to AD 61, and containing burnt structural material and burnt finds such as smashed pottery, remains of furniture and foods. The hoard is the first time that treasure has been found in Colchester town centre and it is the only hoard from the Boudican revolt in Britain. The treasure was found on the same site as some human bones, also dating to the Boudican revolt, and this is the first time that we have found human remains from the revolt in Colchester. The Boudican destruction layer provides a sort of snapshot of the Roman town and a fascinating record of the concrete details of the revolt. The treasure is beautiful and rare and gives us a glimpse of wealthy Roman life – it also tells a tragic story of one individual in the revolt. 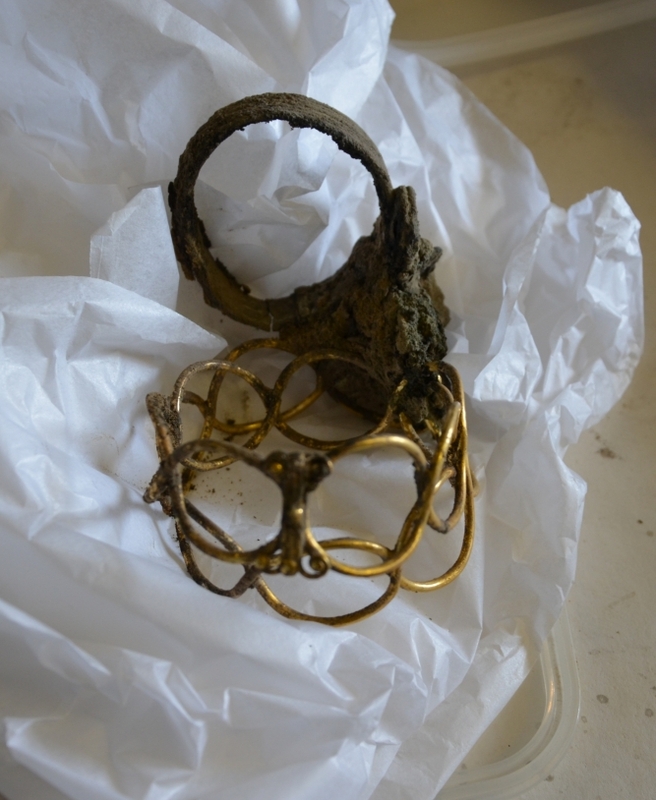 As the conservator and archaeologist expose and remove more of the hoard, in the laboratory, they are discovering more remarkable items, including more beautiful jewellery. We now know that the hoard consisted of five small gold finger-rings (four with gems and one with the incised image of a dolphin), a loose gem intaglio with the incised image of a panther, a pair of silver bracelets, a large silver armlet, a short silver chain, a flat circular copper-alloy pendant which might go with the chain, a plain gold adjustable bracelet, two gold looped bracelets, a pair of gold globe earrings, a pair of pearl and gold earrings, a small bag or purse of corroded silver coins (two of which are Augustan), and a small jewellery box which may have been made of thin silver with some wooden element inside and with external fittings of silver and perhaps ivory. The conservation process will take a while and then the treasure will be studied and reported on. In the future, it will be displayed at Colchester Castle Museum. The Trust’s excavations at the Williams & Griffin store were funded by Fenwick Ltd. 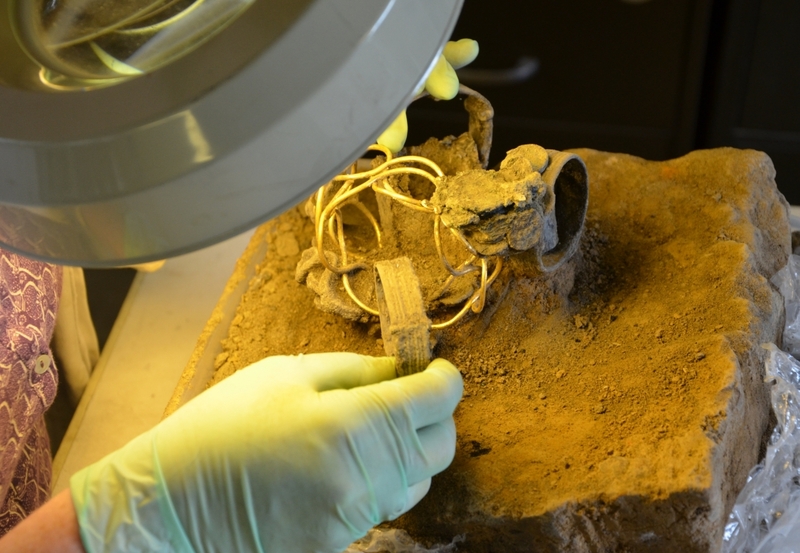 The images show: part of the hoard undergoing work in the laboratory, the adjustable bracelet and the pair of looped bracelets when removed, and the five finger-rings.